Homemade chop saw intended for cutting light metal tubing. 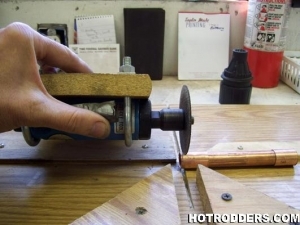 Constructed by clamping a small, pneumatic cutoff tool to a hinged wooden board. Simple yet effective. Great idea. Great idea! Perfect for precision and miniature work.